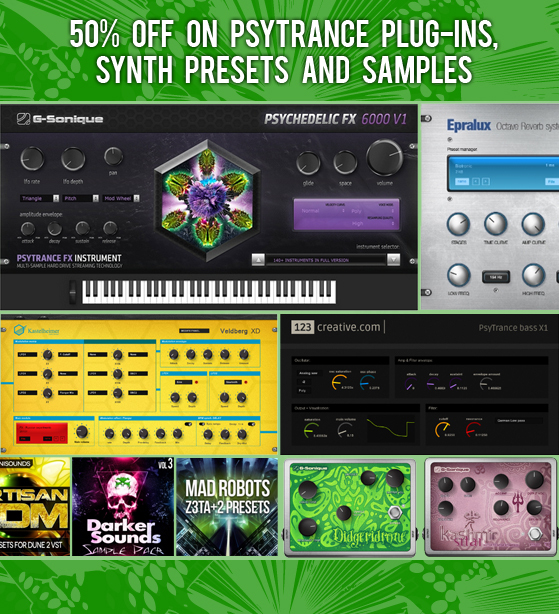 123creative has announced special discounts up to 50% off on all VST plug-ins, guitar effects – VST pedals, synth presets and samples for psytrance, darkpsy, goa trance producers. Synth presets including preset banks for Albino 3 (LinPlug), Bazille (u-he), Dune 2 (Synapse Audio), Renegade (G-Sonique), Massive (Native Instruments), Vaguard (reFX) and Z3TA+2 (Cakewalk) synthesizers. You will receive the best tips and tutorials, we choosed for you from other psytrance producers.